As an upcoming artist, Lose your pride, lose your patience, and lose your mind. But whatever you do, don’t lose hope. Pride is also a determinant of how far one will go in his music career. However, it is very evident that it’s the habit of most upcoming artistes to always give people a false sense of their financial status through their dressings, spending and what not. They are sometimes proud that they raise shoulders to people who are meant to help or make their dreams come true in a little way they can. This is one of the reasons why many of them have failed to blow. So adjusting your pride is very essential if you wanna get your musical contents expose so that people can start developing an interest in your music. What upcoming artist fail to understand is that they themselves are a 70% advantage in their advertisement campaign. In order to blow and become famous, you as an upcoming artist have to advertise yourself aggressively in the highly competitive Cameroonian music industry and you having the internet is a very vital free and essential tool. If you think a miracle is all you need to blow, then you must be seriously sleeping on a moving bicycle. 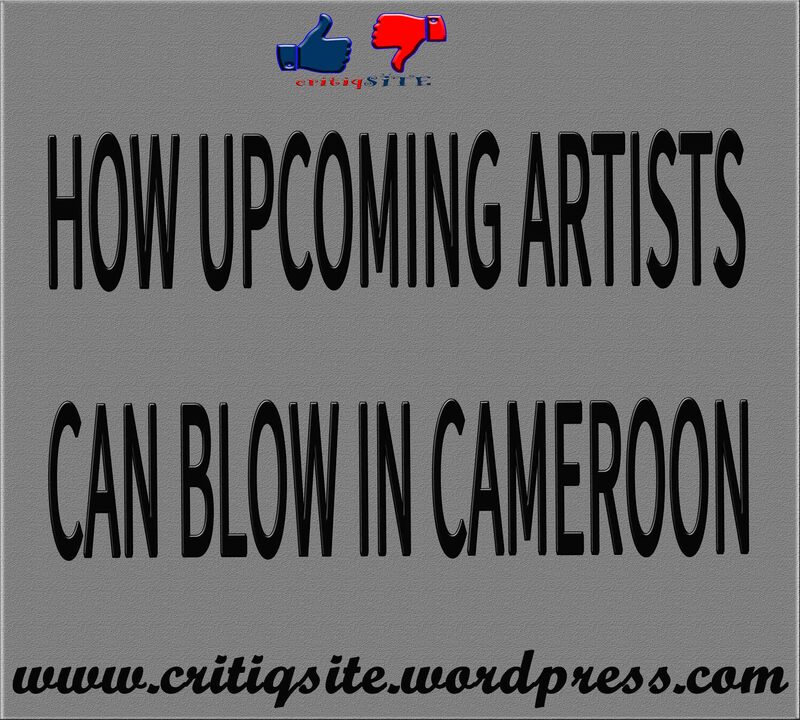 To blow in Cameroon, you have to advertise yourself aggressively and give it whatever it takes. As a matter of fact, it’s not a bad idea advertising that track of yours on a good music blog where we have music freaks who are always at alert to download free and may not even hesitate to share it with their friends if it’s really worth it. Furthermore advertising your musical contents on good music websites/blogs that will help review and write a great article about your music so as to make your prospect feel confident to download and enjoy, for example, we (critiqsite) is out there to promote good music and critique them; other websites/blogs where ardent music lovers are always at alert to download songs and share with their friends is heavily available to be exploited for good course. Sharing your song links on social media platforms like Instagram and Twitter gives you a chance of being noticed. Don’t hesitate to share EVERY post a blogger writes about you on social media so that you might link it with your media following. You need not sing like Beyonce before you become famous. And, the impact of good production cannot be overemphasized. Most upcoming artists are fond of patronizing shady backyard producers who produce low-quality contents at a cheaper rate as cheap as 10 000Frs – 20 000Frs For a song; Ooooh common that ridiculously cheap !!. Spend high and get your music perfectly crafted by a talented producer. Producers Like PhillBill Beats, Soft touch, LeMonstre, Edi LeDrae, Dijay Karl, Dj Zee, Djara On The Beats, Lonie, Salatiel, Akwandor and a host of others are some of the talented professionals that can perfectly craft your music into a masterpiece. Again with their popularity, they will also assist to share your contents since they are also advertising themselves. There are a lot of dope beats free of charge online. All upcoming musicians should make use of them. If you are an upcoming musician and you don’t know how to make your own beats, there a host of sites with lots of free beats to download, different genres like hip hop and rap instrumentals, afropop instrumentals, reggae etc. Now what makes a potential artist standout is a creativity and uniqueness. Take a look at all the artist making in now in the music industry, they all are unique in their own ways. For example, people have been doing hip hop in Cameroon for decades now but when Jovi Dropped his “Don 4 Kwat” everybody was wowed and he stimulated that new style; Mboko Rap.Artist like Locko, Tenor, Mr. Leo, Daphne, Gasha, Ko-C etc all has their unique style of music because they are creative. What makes one stand out amongst his peers is creativity and uniqueness. However, many upcoming artistes fail to get to the peak of their dreams not because witches and wizards are following them, but because they are not creative in any way. So for upcoming artistes to get to the peak of their dreams, they need to be extremely creative. Good lyrics and punch lines are all you need to at least gain some recognition, especially as an upcoming head. Try making your chorus melody memorable, make the lyrics of your chorus the catchiest part of your song. One of the best ways to create your chorus is to intentionally try to keep it different from the verse and bridge. Make your chorus happy, playful, sad… Adapt the emotion with the state of mind of your song. Don’t forget that a song’s chorus is more memorable if it is emotionally moving. A combination of musical and lyrical techniques will make your chorus work for you. To succeed in life, you have to do something others are not doing, or what they have never done. Statistics has shown that creating your own unique style will make people develop the interest in your music. A legend like Koppo already has his own style and that’s his brand, so why copy his style as a leverage to also get to the limelight? when you know that you may be seen as a copycat. Try building your own style. Rapper Stanley Enow has his own style in the industry. Mr. LEO stepped into the Cameroonian music industry with his own self made character that most producers and musicians are emulating his methods. In showbiz, your appearance is the first letter of recommendation. The mode of dressing of many upcoming artists is sometimes childish and annoying. Some upcoming artists dress like masquerades; looking unkempt, poor color combination, unattractive hairstyle, and many more which I cannot mention. The truth of the matter is that, when your appearance cannot catch people”s fancy, how do you convince them to listen to your track? All those points we’ve combined if heavily practiced can make you blow, Stay connected for more awesome insights on how to get your music exposed.